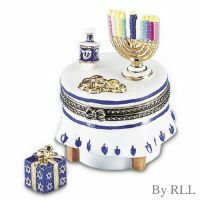 Chanukah Celebration Hinged Box with Present "Treasure"
This beautifully set Chanukah table hinge box contains a surprise treasure inside! Store your favorite trinkets here. 24K Gold accents 3"